The small, picturesque farm is run by Anne Solheim and Urs Gamper, as it has been for the past ten years. We are in Østfold, often referred to as Norway’s grain chamber. The soil is fertile and there’s not a city in sight – only rolling hills with grain, cows and forest. 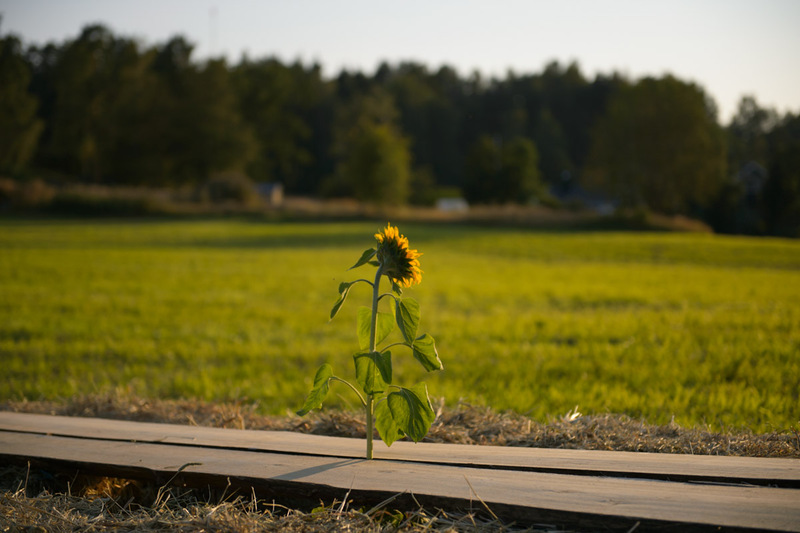 Lislerud is Annes childhood home, so she has seen the farm evolve from a traditional farm with pigs and grains, to a biodynamic farm growing vegetables, salads and sunflowers. Back in Switzerland, Urs had worked in the market garden in the Goetheanum – the cultural center for the antroposophical movement. This was where he learned about the principles of biodynamic farming, and gained enough experience to eventually start farming the land at Lislerud. They went all-in from day one – even though it takes a few years to be approved as an organic farm, and one more to get biodynamic stamp of approval. But why did they decide to become biodynamic farmers? – Because it’s important, Anne says. It may sound like a cliché, but it really is. We want to produce clean food, and we put a lot of love into our work. It’s important to manage the earth in the best possible way. They started farming in a small scale – enough for the family to be at least partly selfsufficient. Sometimes they would sell to people who stopped by, and eventually they came in contact with Bente Westergaard who runs Grønn Gourmet and Helleviktangen Art Café. Delivering to her made it possible for us to expand a bit, Urs says. You have to give it time, and be patient. Once you get to know people, and people get to know you and your produce, the ball will start to roll. Today they grow different types of salad and vegetables, and in addition to the Solheim/Gamper-family, the farm also houses seven sheep, a few hens, a rooster and a friendly, snuggle-loving corgy named Max. And we also have bees, Urs says. We brought them with us when we came to Lislerud. They are usually quite busy with their own thing, but on occasion one of us will be mowing the lawn nearby, and suddenly start running away as fast they can, he laughs. This year’s summer probably will probably not give the greatest batch of honey though. It has been cold and wet, most of the time. If there is someone who really understands how the weather impacts us, it is the farmer. The crops took longer to grow and mature this year. Every year since 2011, we have sold sunflowers to the school, who hands them out to the students when they come back after the summer vacation. But this year we couldn’t, because the sunflowers just weren’t ready, Anne says. So the members of Oslo Kooperativ will get a sunflower in their veggie-bag in a few weeks instead. Three years ago Anne and Urs were contacted by a few eager driving forces for Oslo Kooperativ, who, inspired by the cooperative in Copenhagen, decided to start one in Oslo. The cooperative is memberbased, and offers its members the possibility to buy fresh, organic produce, including meat and dairy directly from local farms, and Lislerud farm happens to be the smallest farm connected to the cooperative. One of the founders and current board member Mads Pålsrud, joined us for our Get Away. Whenever we meet the farmers and discuss the price, we don’t try to get the cheapest possible deal. We let the farmer set the price, because we want the farmers to get a fair price for the food they produce, Mads explains, as he tells the guests about how the cooperative works. You might think this is a bad tactic for the members, but the truth is that this is a win-win situation for both parties. Instead of going to the store and buy food that has been through many links, Kooperativet’s members buy directly from the farmers. Less added costs, cheaper food. For the cooperatives members, it has changed the way they buy food. For Anne and Urs, the deal with Oslo Kooperativ changed their farm. It means they can live from what they make at the farm. Almost, at least. Anne still works in the Steiner-kindergarten, starting fulltime this fall. We want to expand, and that requires money, she says, with a smile. Of course it’s hard to work all day, and then come home to more work at the farm. The goal is to make the farm profitable enough, so that I can work here fulltime as well. As of now, Urs works fulltime at the farm, and on occasion he has been known to help out at the Steiner school, or elsewhere. They also have the students over during the year, as part of their education. At Lislerud, they get to participate in the work – whatever is needed when they are there. And we also play. Throw axes, for example. The girls usually wins, Urs says laughing. The arrangement with the school also gives the farmers extra means to finance the farm, and for the kids it’s valuable education to get to participate and learn about how a farm works. If you want to make it work – it is a good idea to be creative, and think of other ways to make the farm profitable other than producing food. But it all depends on what it is you are after. If you just want to participate and support local farmers, you can buy a share in a farms produce. This method of buying fresh produce in advance is called community supportet agriculture. One of our guests, Evy Andersen, decided to do just that. She bought a share in Grette Andelsgård in Nykirke ,and is very excited about harvesting the first vegetables. I recently bought an electric car, so that made it much easier. But we ”shareholders” in Oslo have a really good system. When we get a message from the farmer that the vegetables are ready, we just carpool to the farm, she says, smiling. Being part of community supported agriculture means you get to reap what the farmer has sowed. For some that is enough. Others want to farm a little bit themselves. Britt Kornum, our forage-enthusiast, and Øyvind Grønlie found the perfect place to do a little farming, just half an hour outside of Oslo. For Britt, not having a useful garden when she had the chance would just be plain wrong. When I grew up in Denmark it was abnormal not to have your own potatoes. There was always a competition between our neighbours, and the goal was to be the first to have own potates for «fried pork and parsleysauce», she explains. By now they grow jerusalem-artichoke, potatoes, kohlrabi, kale, red beets, fennel, zucchini and pumpkin. Britt is an avid fermenter, so the veggies that are not boiled to a puré, become fermented and kept in jars. They also have fruit trees and berries and tomatoes and cucumbers in the greenhouse – and in the backyard they have built two additional houses – one for the hens, and one for the goats. We started out with five hens, but they quickly became more. Keeping hens is an easy, but rewarding task. We get eggs and really good fertilizer. When we have to slaughter them, we boil stocks and broths on the parts we don’t eat. Working full time and keeping animals can prove to be tricky, but Britt and Øyvind are blessed with good neighbours and flexible employers. – It’s a little bit like having children. Suddenly something unexpected happens, and you have to stay home to feed a newborn kith who can’t get any milk from it’s mother. And there are no sick-days for little kiths. Back at Lislerud, on this lovely late summer day, the harvest is done and the food is about to be ready. The vegetables, freshly extracted from the soil this same day, are baking in the oven. The meat is ready to be served, and the salad – a mix of farm-grown greens and foraged weeds and flowers – is bursting with delicious colours. Out on the field, around a long table in the sunset, guests, farmers and Food Studio crew have found their place. Even though we are all a bit hungry by now, after a long day in the sun, the mood is good. Perhaps that’s what happens when you really work for your dinner, and you work together to make it happen. Perhaps the food you eat then becomes something more than just nutrition, or good tasting, or bad tasting – or the worst – just okay? When the first dish arrives at the table, it is the simplest thing, and yet so delicious. Fresh, tiny cauliflowers tucked into a pink mallow flower. – They were so good, the «chefs» say, that we decided not to boil them, just serve them as is. That is what you get when you combine good soil, dedicated farmers and a dash of love for the land: Food that is delicious on it’s own, but with just a few grains of spruce salt sprinkled on top turns into pure perfection. Have a look at the photographs of our day at Lislerud Gård here.